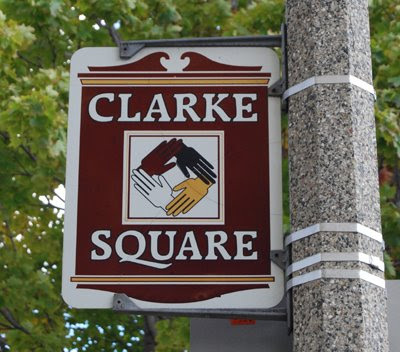 Located between Pierce Street and Greenfield Avenue on the north and south, and 16th and 27th Streets on the east and west, the Clarke Square neighborhood is an ethnically diverse area just south of the Menomonee Valley. In 1837, land speculator Norman Clarke and his wife Lydia purchased 160 acres and founded the neighborhood. The area filled quickly with European immigrants coming to Milwaukee and working in the Valley. Clarke Square Park, named after the couple, is off Mineral Street between 23rd and 24th Streets. Looks like a nice place. Lovely photo too of the area sign!